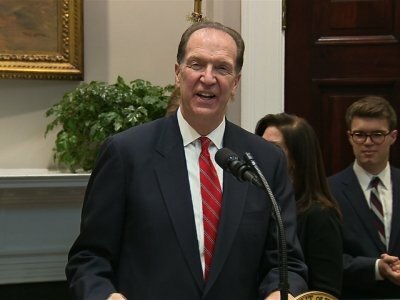 WASHINGTON (AP) — President Donald Trump plans to nominate David Malpass, a Trump administration critic of the World Bank, to lead the institution. KINSHASA, Congo (AP) — He wants to run Africa's second-largest country, one of vast mineral wealth, sprawling poverty and vicious fighting that has cost millions of lives. Noel Tshiani Muadiamvita's chances are slim to none but he's convinced he's perfect for the job. BEIRUT (AP) — Lebanon marked 75 years of independence with a military parade Thursday in Beirut, but many anxious Lebanese feel they have little to celebrate: the country's corruption-plagued economy is dangerously close to collapse and political bickering over shares in a new Cabinet is threatening to scuttle pledges worth $11 billion by international donors. BOGOTA, Colombia (AP) — The World Bank is estimating it will cost Colombia upward of $1 billion to tend to the surge of Venezuelan migrants fleeing their nation's economic and humanitarian crisis. WASHINGTON (AP) — The World Bank and the Inter-American Development Bank are providing Argentina with three loans totaling more than $1.8 billion, aiming to help the South American country cope with financial difficulties and support citizens most at risk. JOHANNESBURG (AP) — The European Union says it has approved 100 million euros ($116 million) in its first-ever budget support to Somalia's government in the latest sign of confidence in a country long shattered by conflict. The EU announcement comes a day after the World Bank said it would provide $80 million in direct financing to Somalia's government for the first time in 27 years, calling it a "milestone." JOHANNESBURG (AP) — The World Bank is providing direct financing to Somalia's government for the first time in 27 years, calling it a "milestone" in the reconstruction of the Horn of Africa nation long shattered by fighting. A statement says the bank's board of directors has approved $80 million in investment programs to help Somalia's federal government "mobilize and redistribute the resources needed to rebuild the country after three decades of conflict." JERUSALEM (AP) — The Gaza Strip's economy is in "free fall," a report from the World Bank warned Tuesday, calling for urgent action by Israel and the international community to avoid "immediate collapse." According to the report, Gaza's economy contracted by 6 percent in the first quarter of 2018. It said unemployment is now over 50 percent — and over 70 percent among Gaza's youth. WASHINGTON (AP) — Global poverty has fallen to a record low. The World Bank said Wednesday that 10 percent of the world's population lived on less than $1.90 a day in 2015 — the last year for which numbers were available — down from 11.2 percent in 2013. That means 735.9 million people lived below the poverty threshold in 2015, down by 68.3 million from 804.2 million two years earlier. BEIRUT (AP) — A senior World Bank official said Tuesday that the Lebanese economy is "not doing great" and urged the country's leaders to approve some $1.1 billion worth of projects put forward by the international lender, saying otherwise they could be cancelled. WASHINGTON (AP) — The steadily expanding global economy should remain resilient — at least for a couple of years — the World Bank says. The anti-poverty agency predicted Tuesday that global growth will decelerate from a solid 3.1 percent this year to 3 percent next year and 2.9 percent in 2020. AMMAN, Jordan (AP) — The U.N. agency for children said Monday it has distributed cash to nearly 1.5 million families in war-battered Yemen to help avert the risk of famine. The emergency payout, part of a $200 million World Bank-funded program, comes in the fourth year of a civil war that has killed more than 10,000 people, displaced more than 3 million and crippled the country's infrastructure. TIRANA, Albania (AP) — In a story May 9 about the situation of Roma in the Western Balkans, The Associated Press misreported or didn't properly explain some of the statistics in a report by the U.N. Development Program and the World Bank. WASHINGTON (AP) — The International Monetary Fund and the World Bank repeatedly warned at their meetings this week that intensifying trade tensions could jeopardize a healthy global economic expansion. The World Bank's policy committee has approved a $13 billion increase in the bank's lending capacity. The proposal was approved late Saturday by the World Bank's Development Committee, which sets policies for the 189-nation lending agency. The increase in lending capacity was tied to a package of lending reforms that had been sought by the United States. NEW YORK (AP) — Roughly seven out of every 10 adults worldwide now have some form of bank account, the World Bank said Thursday, largely due to the proliferation of cell phone-based bank accounts and other simple bank account programs in places like India and Sub-Saharan Africa. ADDIS ABABA, Ethiopia (AP) — Ethiopia's leader has rejected arbitration by the World Bank on a disagreement with Egypt over the hydroelectric dam that Ethiopia is building on the Nile River.